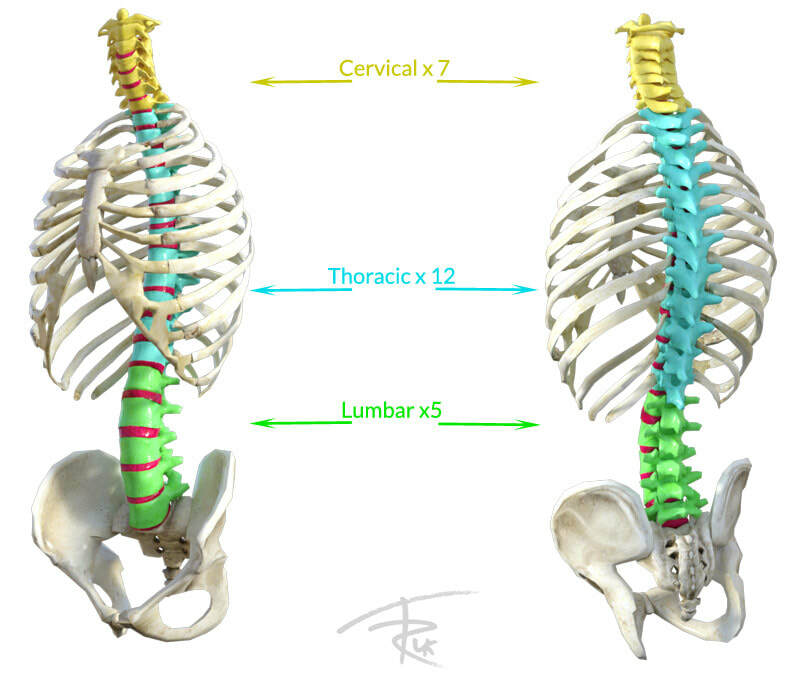 We have two facets joints on either side, at each level of the spine. They vary in size and shape but all full fill and important role. they are perhaps the most common reason that we see people for back pain for at Team Rehab but why do they suddenly start to hurt and how can we help you? Our spines are made up of a number of bones 'stacked up' on top of each other called, vertebrae, and these are linked together by ligaments and muscles. These 'movable' parts of the spine can be split in to three areas, the base (lumbar) containing 5 vertebra, the middle (thoracic) with 12 vertebra and the neck (cervical) with 7. 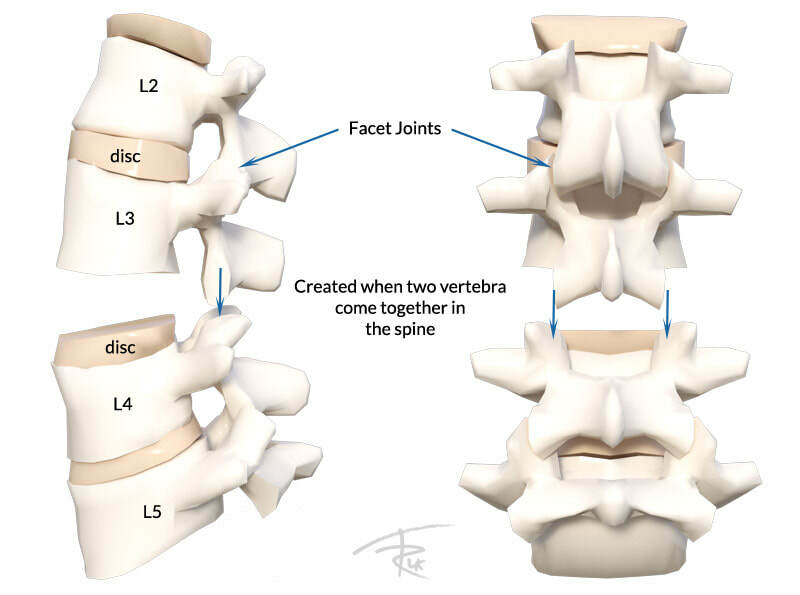 Each vertebra, throughout the whole spine, is joined above and below by a pair of small weight bearing joints called the facet joints and these are designed to allow, but control movement. ​The joint surfaces have a fine cartilaginous lining tissue to help with cushioning and provide protection. The size and shape of the individual vertebrae changes from being much larger at the bottom, to smaller at the top. This is a consequence of, and indeed a reflection of, the larger forces that are subjected to the vertebrae throughout the lower back in comparison to that at those at the neck. Despite this, there is actually a lower proportion of pain attributed to the facet joints in low back pain than in neck pain, and this is thought to be due to the variations in available movement at the vertebra, and also the angle of the joint. Why Do Facet Joints Get Sore? Like any other joint in the body, facet joints have the potential to become sore. This could be through trauma, congenital (born with it) or degenerative abnormalities. The normal presentation is of a generalised aching over the lower back area that is maybe a little more tender locally around the joint site. The pain may be quite sharp if pressed or if you increase the load through the joint (e.g. bend backwards, down to one side, or a combination of them). The achy feeling can often travel into the buttocks or even the upper leg in some cases. The reason for this diffuseness around the joint is likely to be due to the inflammatory (see below) underpinnings of the condition but may also be due to compensatory postures and movements. In simple facet joint pain, it is important to point out that the major nerves are not generally being compressed and so the risk of long term damage is not normally significant if dealt with appropriately. When we recieve a bodily injury our body reacts in an attempt to fix it, in this case, a facet joint injury. Part of this process involves the delivery of a chemical soup commonly gloabilised as inflammation which, in simple terms, delivers ‘fixing‘ agents to the area of damage but also helps to reabsorb any 'damaged' tissue. ​Unfortunately, one type of nerve ending, the chemoreceptor, is excited by the presence of some of these chemicals and subsequently fires lots of impulses in response that eventually reach our brain. These slow travelling impulses are responsible for the widespread, deep toothache feeling. Does Facet Joint Pain Get Better? Most facet joint irritations are self-limiting and react well to simple conservative management such as medication, physio, education and or exercise. At Team Rehab uk this is one of the most common reasons that we see in clients seeking advice and treatment for low back pain. Treatment can be varied depending on the exact presentation but may consist of simple education and self management techniques, joint mobilisations, soft tissue release, electrotherapy (ultrasound etc), ice/heat regimes, exercises etc. In those cases where pain persists you may need further diagnostic tests such as MRI Scans or Facet Joint Injections, but this is best done under the guidance of your consultant. The injections are not solely curative, but also diagnostic and in some cases can provide a period of temporary relief in which to enable conservative interventions, such as physiotherapy, to work more effectively. The most important aspect in the management of LBP is differentiating between those problems that have the potential for serious harm, and those that are likely to settle. ​Thankfully, the latter is the majority group however you should always consult your Medical Practitioner or Therapist if you are unsure.